A simple sentence that wouldn’t normally elicit any reaction during happy hour or a weekend. But it’s a Tuesday at noon. Which made me think, why not a revolution or more of an act of solidarity among beer lovers? To make my case, here are three reasons to have #Beerswith our colleagues, friends and clients for lunch. 1. Beer time doesn’t have to mean “play” time. Anthropological studies have shown that drinking in general is “already segregated and separated from work” and more of a nighttime activity, likely due to leftover social misconceptions from prohibition era. But these same studies also show that this attitude is far from universal. In cultures the world over, regrouping at lunch with a beer is just as common as the after-work drinking session. In countries like Germany beer is such a vital part of the culture that not only is it normal to have a beer with lunch in a workplace setting, but it is also common to see the right to drink beer at lunch written into a employment agreements. Based on studying beer lovers in the U.S., I hear time and time again how they feel some of their best procrastination-busting moments come after relaxing with co-workers for a few minutes over a beer. Just imagine what we could accomplish by shifting gears away from the “grind” mentality with an occasional office-hours beer. 2. Having #Beerswith colleagues is good for workplace morale. From both an anthropological perspective and basic human reasoning, beer has long been regarded as a social leveler, and the act of getting together for a beer fosters communication between those of different ranks and status in society. In a workplace setting, allowing coworkers to enjoy the occasional brew at lunch (especially those on cross-functional teams or between bosses and their direct reports) can open up lines of communication. The mere presence of beer creates a relaxed, collaborative atmosphere that one wouldn’t get over a coffee break or around the water cooler. Many employers choose to give their employees meal breaks, as it is good for employee morale, encourages social relationships between employees, prevents burnout, and can improve productivity. However, it may come as a surprise to you and your stomach that the federal law governing labor standards, the Fair Labor Standards Act, does not require employers to give their employees any meal breaks. (Whether an employee is paid for his or her meal breaks that he or she is allowed to take may be a matter of federal law, the team at https://www.rattolaw.com/ will be able to provide you more information about his topic. 3. Prohibition is Long Gone: Our forefathers suffered enough so we don’t have to. Sad, but true. Drinking at lunch almost ruined beer for all of us. In the early 1900s, it was commonplace for pubs to offer “free lunch” with a purchase of an adult beverage, thus attracting the attention of the temperance movement. In the context of rampant unemployment of the time, day-drinking in exchange for free food represented a social ill that prompted extremist to side with banning booze altogether. It was this attack on the idea of “There’s no such thing as a free lunch,” that actually fed the temperance movement argument, ultimately leading to the passage of prohibition. Today, let’s not judge ourselves by such antiquated rules. If you’re holding down a job, chances are you’re a responsible adult capable of drinking in moderation. To sum suds it up, most beer lovers and Americans know how to enjoy beer responsibly – and sometimes the responsible thing to do is to trust and empower our employees, coworkers and ourselves to be a little more human and social. 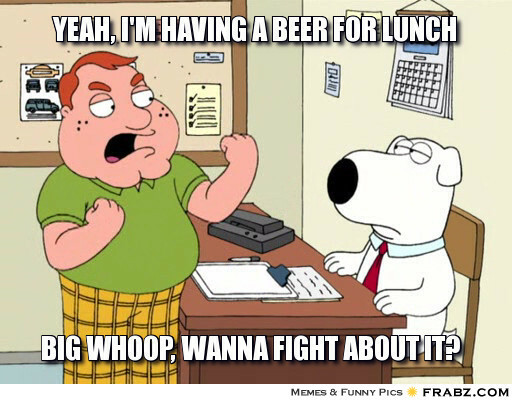 If we were able to repeal prohibition, then we should be able to also give ourselves permission to go back to our roots and enjoy a work day lunch with a beer. After all, there are plenty of lagers and sessionable ales that offer lower alcohol content for this mid-day occasion. Fellow beer lovers – do your part – have #Beerswith – lunch and a friend this work week. Who’s in? Next ›Do Brands Have The Power To Change The World? How do the Germans handle that one employee out of fifteen or twenty who won’t stop at one?